In a large bowl, combine corn flakes and seasonings. Reserve. In a large bowl, combine eggs, milk, mustard and honey. Reserve. Prepare a baking sheet with cooking spray. Reserve. Place a piece of chicken in bowl with egg mixture; toss to coat. Shake off excess and place in bowl with corn flake mixture. Press to adhere and place on baking sheet. Repeat with remaining chicken. 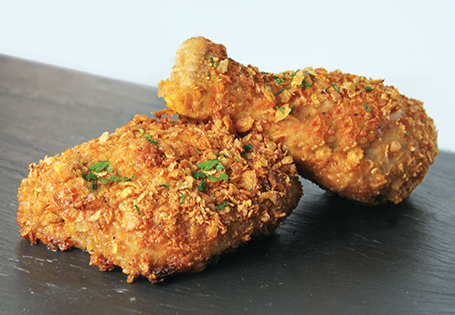 Drizzle with butter and bake for 25-30 minutes or until chicken has reached an internal temperature of 165°.